George Kittle is relishing the added competition on the 49ers roster and has no problem with San Francisco potentially drafting players who could take catches away from him. Kittle was the focal point of the San Francisco offense last season, breaking the record for receiving yards in a single season by a tight end as he racked up for 1,377 despite playing for a Niners team that went 4-12 as an injury to starting quarterback Jimmy Garoppolo derailed their campaign. The former Iowa star demonstrated an excellent rapport with backups C.J. Beathard and Nick Mullens but, with the Niners having reportedly been interested in Odell Beckham Jr. prior to his trade to the Cleveland Browns, San Francisco appear likely to be in the market to add a receiver in the draft. They signed wideout Jordan Matthews in free agency as well a talented pass-catching running back in Tevin Coleman, with Kittle more than happy for the 49ers to bring in players who could eat into the 136 targets he received in 2018. "Whatever [general manager] Mr [John] Lynch and coach [Kyle] Shanahan do, I'm fully behind. Whether they bring in more wide receivers, more tight ends, more running backs, I'm all for," Kittle told Omnisport. One receiver who will not be playing for the 49ers this season is Antonio Brown, who was traded to the Oakland Raiders last month. Talk of the Niners being in the mix for Brown exploded on the back of Kittle tweeting at Brown as news of his fall-out with the Pittsburgh Steelers emerged. And Kittle conceded he was surprised by the reaction to his tweet. "That was kind of crazy, that was all Jimmy G dared me to do it on New Year's Eve, it was kind of later in the night so it was pretty easy for me to send that tweet," he added. "It was crazy, 10 minutes went by and he retweeted it and quoted it and I was like 'oh wow this is going to be interesting'. I was all over everywhere the next day and I was like 'well that's fun', other than that though I didn't think too much of it, I was just having some fun." San Francisco reinforced the defense in free agency by signing linebacker Kwon Alexander and cornerback Jason Verrett, while also trading for pass rusher Dee Ford and signing him to a huge extension. 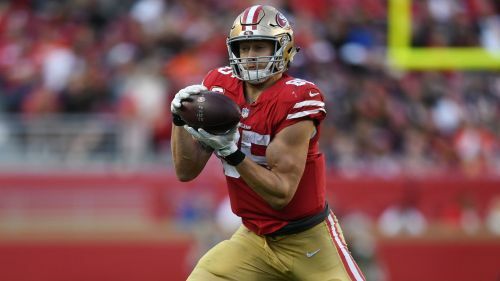 Those acquisitions may make practice tougher for Kittle, but he is confident that will have a hugely positive impact on the team. He explained: "The second that we signed those guys, I was upset because I have to go against them every single day. They're really good so it makes my job harder but at the same time I love that. "The competition's going to be absolutely incredible and that's what creates champions, competition. That's something that Richard Sherman came in and said day one [last year] in the locker room 'hey we need more competition if we want to be a winning football team’ and that hit me pretty close to him because that's the way I've always felt. "Getting guys like that, playmakers and just adding them to our team, I can't wait for our spring football practices to start so I get to go against them and kind of get a feel for how they move and how they're going to be in the locker room and out on the field. I'm just really looking forward to that level of competition and going against them every single day will make me a better play too, so that's something I can't wait for."